Brother Benny overlooking Harrower Peak and Indian Basin on our second day in the Wind Rivers. For the last five years the mythical Wind Rivers have eluded my presence. Approaching a construction zone 20 minutes outside Pinedale, Wyoming a flagger stands between us, rotating his sign to “stop.” His animated body language asks only for a momentary interaction – September 22nd, 2015, unseasonably warm for the high alpine, clear blue skies and searing heat begs for one last summer adventure. My blacked out 1994 F150 grinds up the mountain road with my brother Ben close behind in his 1990 Toyota pickup. We closely monitor each-others progress with eager glances in our rear view mirrors. “Where are you headed,” states the flagger “ohh man get stoked, you’re about to enter the land of gnarnia. There will be gnomes, trolls, and goblins foaming from the cracks and spires up there.” Without question, the flaggers excitement only validates our feelings of allure. Leading up to the trip I had certainly been overworked, a busy summer of 70-95 hour work weeks positioned me at the end of the rope. My brother Ben has recently become my main adventure buddy after relocating to Steamboat Springs for a year and a half where we spent many a night shoulder to shoulder in a Big Agnes tent while exploring the Colorado wilderness. My brother Ben now lives in Bozeman, Montana, therefore meeting in the Winds was logical (equal driving time between Bozeman and Steamboat). Beforehand I would drive the extra 77 miles to Jackson Hole to spend a night together with Ben, but also one of the humblest and talented individuals I have had the pleasure of meeting. Conor Pelton grew up in Manistee Michigan and we met during my second year attending Colorado Mountain College in Steamboat. Once a strong ski racer, Conor had switched gears when I met him, dedicating his skiing priorities to freestyle. Within months he was hitting the big jump line at 70ft and throwing 1080’s, Conor currently skis on the Freeride World Tour…the highest level of big mountain skiing. I can remember one specific experience with Conor that immediately strengthened our friendship. One spring evening we decided to head out on an urban rail mission. We traveled 30 minutes to the small ranch town Oak Creek, and found ourselves at the back of the High School where a 50 ft. single-tubed down rail was positioned in the center of the stairway. Intimidating to say the least, the cement stairs were surrounded to either side by a 1 ft. drop onto dirt and rocks. After both of us took a good beating, Conor eventually cleaned the rail, however it was then we realized the car battery wouldn’t start – we would end up spending the night wandering the vacant town attempting to flag down a vehicle for a jump. After arriving in Jackson we soon met up with Conor and enjoyed a few beers at happy hour, proceeding to make our way north of town where we would spend the night camping at a locals’ favorite outside Jackson by the name of Shadow – where a rough road leads to perfect car camping spots perched on a hillside 1,000ft above the Teton Valley. However, we didn’t make it to Shadow without a stop at the Creekside Market…a locals’ favorite for breakfast burritos, sandwiches, beer, and other grab-n-go necessities. Conor insisted we grab a “Sloshy” before our journey to camp. The frozen fruity alcoholic beverage is offered behind a typical door embellished with a “21 years and older sign” with ample 1 oz. samples if you are the curious type. After topping off a 12 oz. cup of frozen alcoholic goodness, it only seemed natural to start sucking this thing down as we approached the register. Our composure could only calm the raised questions of the cashier as he glanced more than once at our unusual comfort. Eating his lunch, he must have been nearing the end of his shift with lack of concern. “Wow, this place is pretty rad” I thought to myself as the cashier insisted I try a few of his chips. One handful, and two handfuls followed by a couple sips, “they must know we’re driving” …our complete comfort within the situation questioned the normality. Meanwhile Conor – with a guarding eye – found tremendous humor in the unfolding situation as we proved to exit the store, placing the sloshies on our trucks before hopping in and cruising down the road with the internal dialog, “police officers must know exactly what these are, but everyone seems to be fine with it… oh well!” Conor would later inform us they usually place a seal over the straw for that exact reason, and if broken…well, you get the point! Haha our time in Jackson couldn’t have been more perfect, thank you Conor! After our interaction with the construction zone flagger, a warm PBR was cracked promptly…the sure sign that an adventure is near! 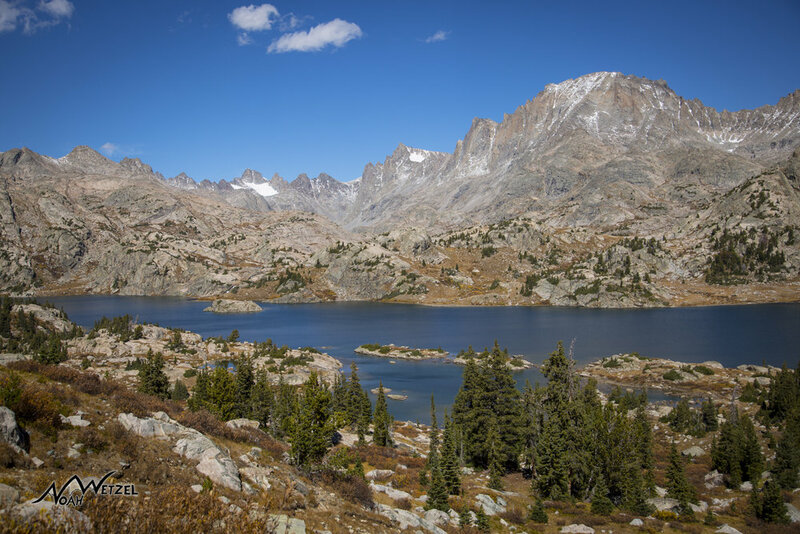 The sheerness and beauty rumored in the Wind River Range couldn’t have helped make the weight of our packs disappear. Prepared for 4 days, they were certainly heavy, that didn’t stop us from tacking on a solid 40 miles though. 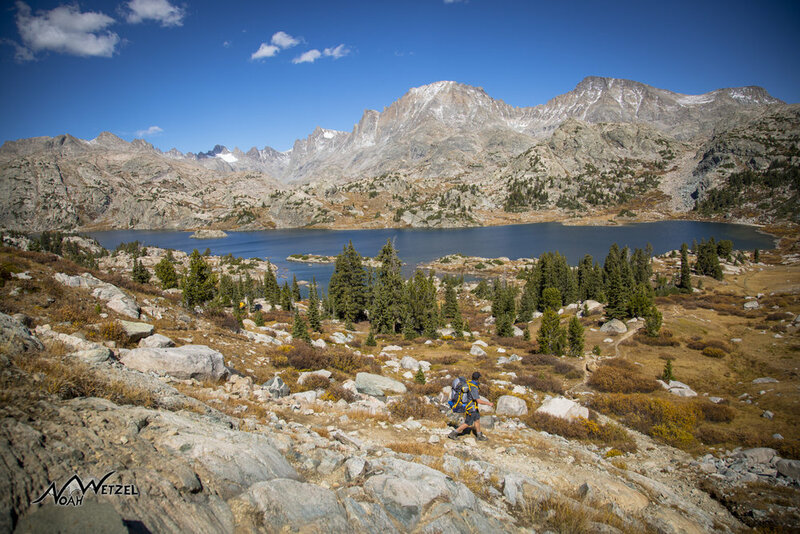 Each wilderness area is unique; however, we all know the miles of some are more or less taxing than others. Extended climbs immediately followed by equal decline, sandy and loose footing, along with trails that are so shadowed by tree cover you never have the ability to gauge distance or enjoy the view of the area. 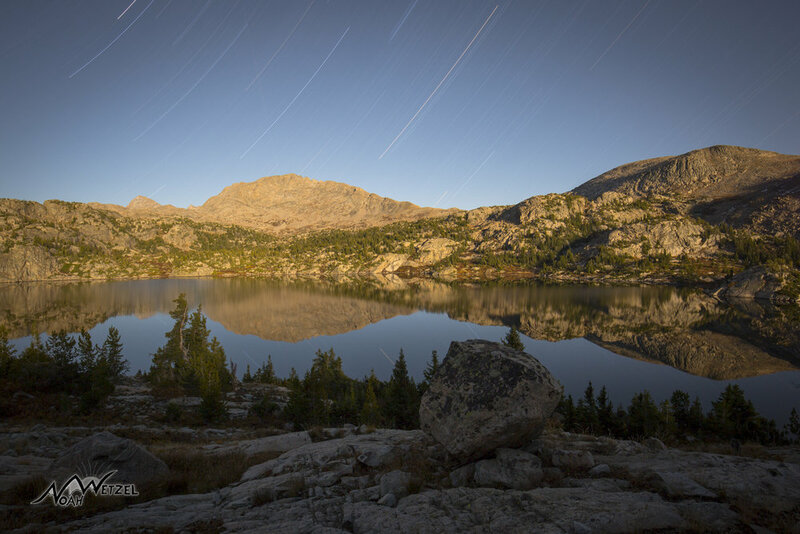 The Wind River Range stretches 100 miles northwest to southwest and our 40 miles only scratched the surface of the area. The miles we did accomplish were very consistent though and enjoyable, the trail was well maintained, easy to follow, the trees evenly spaced with gorgeous views every mile or so motivating us with our apparent progress. Approaching sunset we called our first day settling in for the evening above Seneca Lake. Overlooking Seneca Lake at 10,000ft, the view couldn’t be more beautiful. 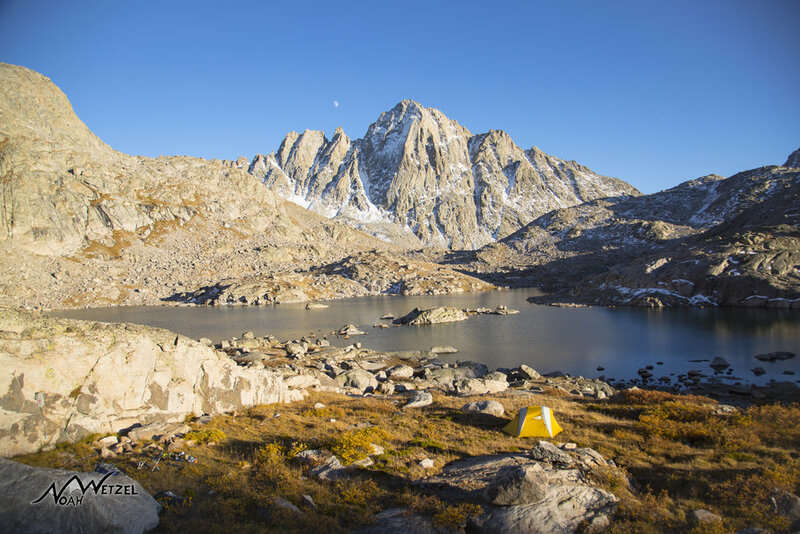 Looming in the distance, Titcomb Basin demands your curiosity as you can’t help but imagine the next day on the trail. Perched underneath a vivid sky, not a ripple disturbed Seneca Lake, once again giving way to dawn. Perhaps the weather we experienced is directly related to global warming, experiencing clear skies and temperatures rising to 70 degrees in late September at 10,000ft. 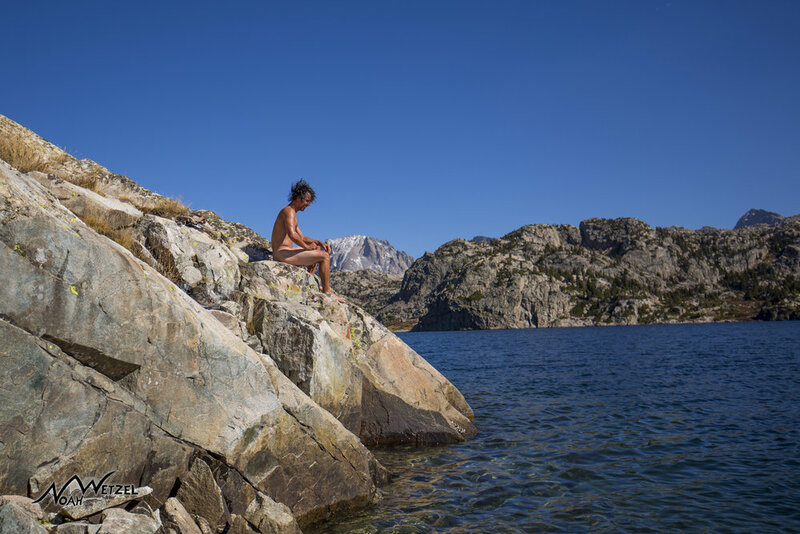 Without further question my brother leaps into the frigid water with conviction, for means not solely purposed for cleansing our oily skin, but also for its refreshing and revitalizing effects on the body and mind. With a bit of hesitation, I finally commit with the fear in my gut comparable to hitting a 50ft cliff on skis, my arms swinging rapidly to get out of the water before I even broke the surface of the water. 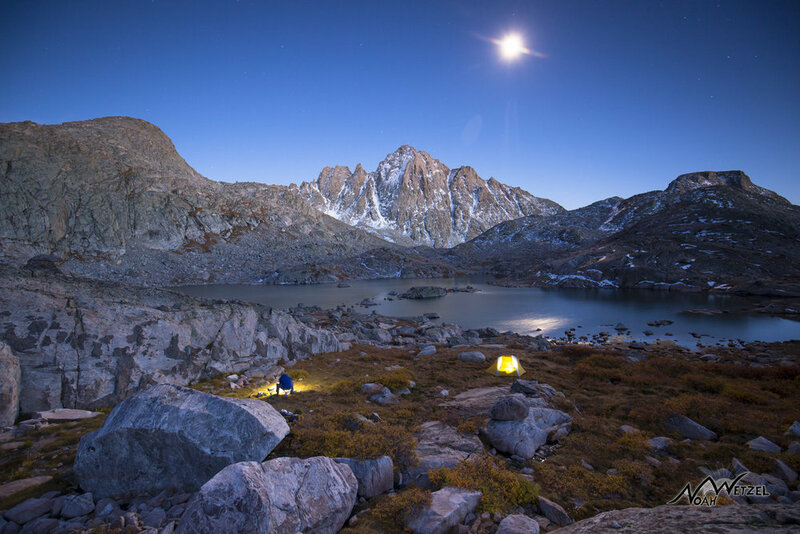 The searing rays of the thin atmosphere quickly dried our skin, and once again weighted our shoulders, beginning the stride towards Island Lake…our destination, Indian Basin. My brother Ben and I have formed a unique bond over the years, and my love for him goes beyond words. Growing up in Wisconsin we shared bunk beds until I departed for college when he was 12. Ben was always tough with an even stronger mind. As on older brother, we certainly did play rough with him, and with that he kept to his own, never revealing any signs of need for guidance or friendship from us. Deep inside, both of us knew we cared for each other. 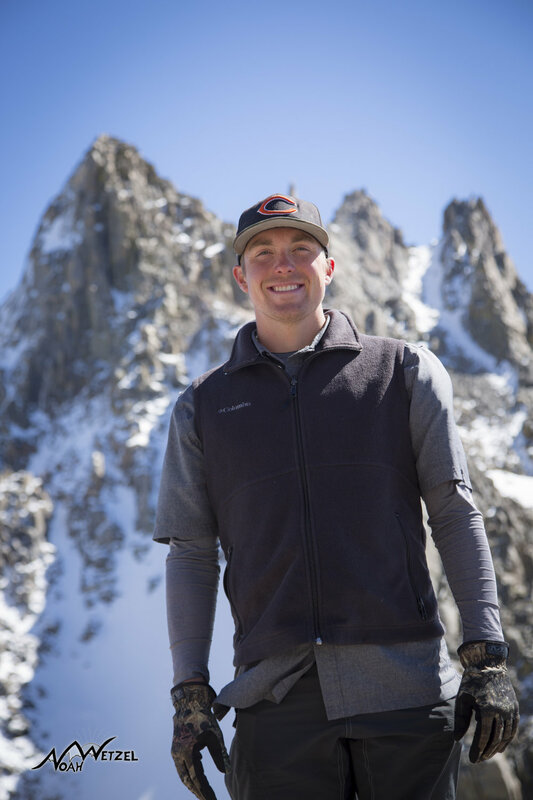 Once Ben moved to Steamboat our paths grew close in similarity, finally understanding the importance of the wilderness and the connection to who I truly am. Although my family certainly knows me and fully supports me, Ben is the only individual who truly understands who I am. Walking side by side we exchange stories, beliefs, motivation, and our inspirations with nothing but the smell of thick pine and penetrating beams of light that seep down to the forest floor. A deep breath is often needed every few minutes, inhaling with wide eyes and nostrils, absorbing every scent within the moment. 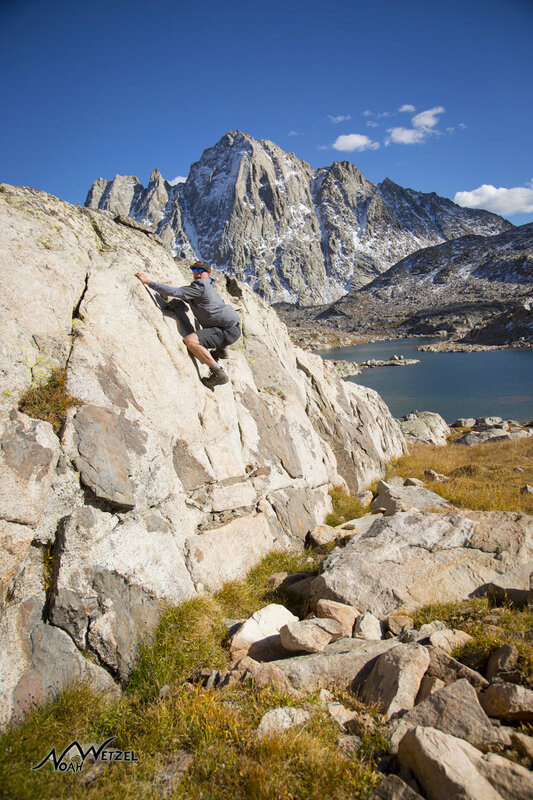 Vertical walls of towering granite surround us as we traverse across a lunar-like landscape. Boulders large and small dot the landscape beneath these enormous walls as we dance our way across cascading creeks flowing from small pockets of water – reminiscent of Beartooth Pass in Montana. This is truly a barren environment. Besides water and matted down grass from the first snowfall, there’s little life at 11,200ft besides a handful of birds that repeatedly dive below the surface for what I would assume is food. There is a stillness that overwhelms your senses, begging for you to drop your current task and sit back in amazement. Throughout the afternoon, we set up our camp, continually surprised by the dramatic beauty when raising our heads for a moment’s notice! Over and over, we are utterly surprised in awe as if we have forgotten where we were “ohh my god” I chuckle… “this place is ridiculous” only to experience the same emotion a moment later when I raise my head once again. As the blue sky fades and the horizon starts to glow with orange, a pink hue is cast upon the 2,000ft face of Harrower Peak. Knowing my passion and responsibilities, Ben prepares our dinner without question, knowing I will be scrambling around attempting to utilize the small window of light to capture the moment. When I am backpacking by myself, my meals usually arrive after sunset, therefore I am very thankful to have my brother with me because he knows it’s my profession and graciously continues cooking. After dinner our conversation turns reminiscent as we discuss the people in our lives we care about. Ben now married after this past February, discusses his girlfriend Veronica at the time and his actions if they ever parted ways. I could tell then, but I now know the severity of his feelings reflected in his sullen composure on this particular night. 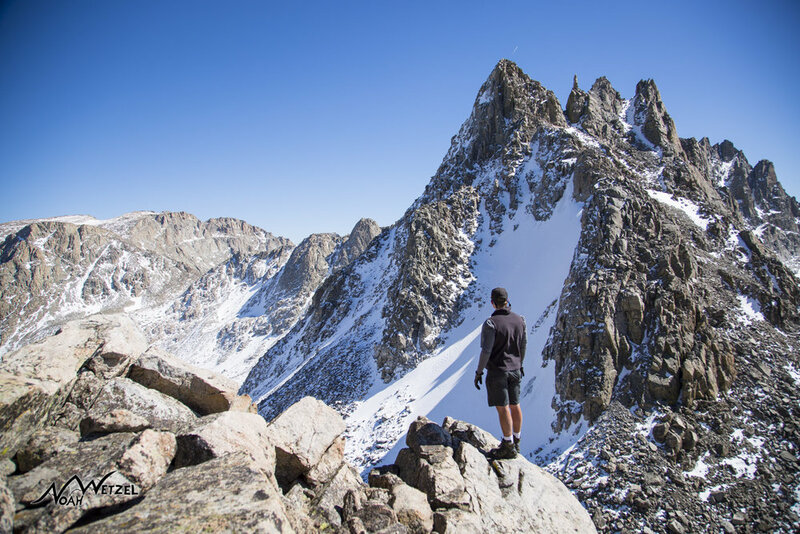 In that moment he was most certainly debating Veronica’s companionship the remainder of his life, and there couldn’t be a better place to experience clarity than the Wind River Range! That night was the best campsite I can remember in my backpacking experience (seriously #1, even with no fire). Magical is only one of a few words that would come close to describing this area. Later that evening we would retire for the night, slowly serenaded to sleep by a nearby gurgling trough of water running near our tent – a few weeks later the proposal was confirmed! 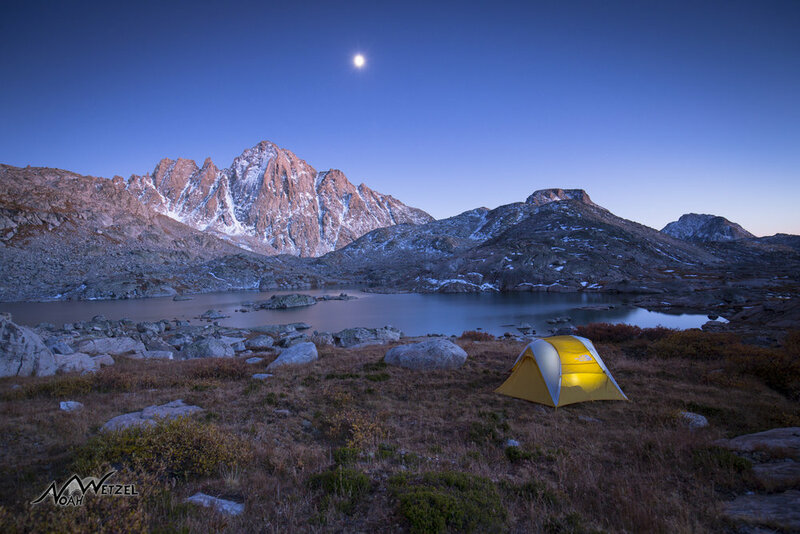 The following day we found ourselves returning once to Island Lake for night three. Although there isn’t much available firewood surrounding Island Lake, it most certainly wasn’t a concern. In order; Indian Basin, Island Lake, and Seneca Lake are the top 3 locations I’ve ever placed a tent for an evening. It just so happens they were all in a row on the same trip! Typically, the hike out of an area is never ending. 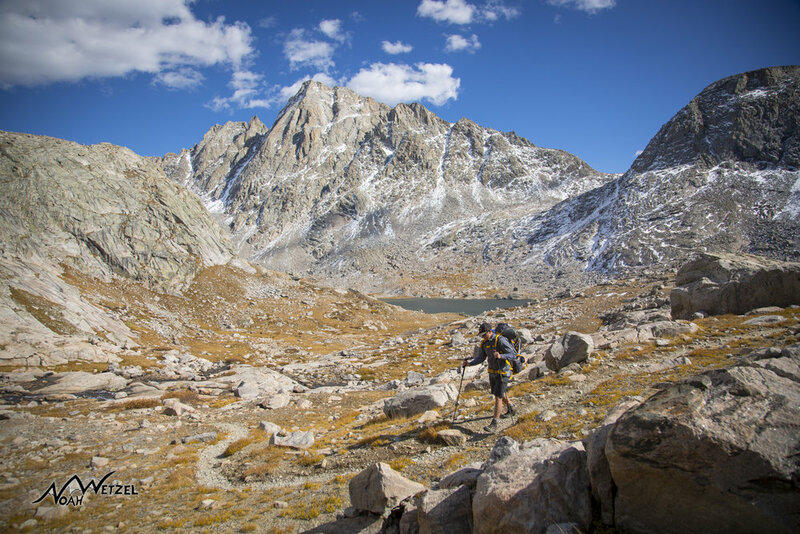 Sometimes it feels as if the TH is moving step by step at your pace, and with each passing mile the pressure on your shoulders and the balls of your feet become unbearable, the straps of your backpack digging in like a serrated knife. Our lighthearted conversation effortlessly wisped us along, our progress unknown with 12 miles of certain trail. Through the trees a road appeared that we must have missed on the drive in. Adjacent to the trail we both questioned what it was. Two old black trucks appeared side-by-side to our surprise, with elation we had arrived at the TH with energy to spare. This was my only backpacking experience with such a feeling…while slowly removing our packs with a smirk ear to ear. 10 second timer. Ben and myself after returning to our vehicles. Overjoyed with thoughts of mass caloric consumption, we took one last glance at the TH and cracked a warm celebratory PBR descending to Pinedale. On our way back I couldn’t help but hope the flagger would be there. Four days later, and in the same location there he was…and more excited for us than any normal bystander. It must be the energy within the Winds that evokes passion in totals you cannot account. One hundred and eighty dollars later we’d receive the bill at the infamous Wind River Brewing Company, but not before noticing the exact resemblance of our campsite at Indian basin, (Harrower Peak on the beer can in front of us, the same vantage point as our campsite). You simply know you’ve been to one of the best spots when the mountain on the logo of the beer can matches your campsite. We were spot on! Touché Benny Boy, Touché!